Let’s face it – you need a break from the firehose of decisions, meetings and stress that comes with being an Internet company CEO. My suggestion: attempt a fun, ambitious, slightly harebrained construction project! 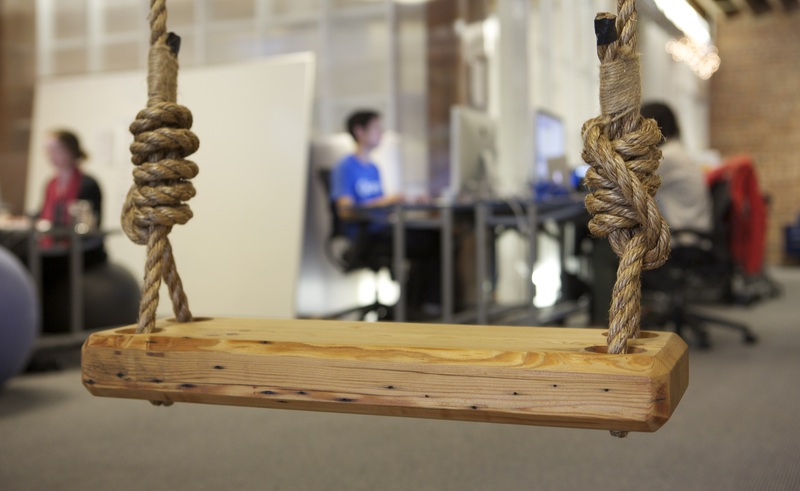 Last weekend I tackled just such a project: hanging old-school tree swings in our office. It was both physically and mentally refreshing – and as a bonus, I got some cool points from my team, which should last about a week. Here’s how I made it happen, and how you can too. I got my inspiration during San Francisco Design Week, which had a “design crawl” where you could visit product design shops with really creative work environments. One of them, Lunar Design, had a swing hanging from ropes hooked over a huge crossbeam in their office. It was getting a lot of attention. Hmmm, I thought… we have huge wood beams in the Quizlet office and high ceilings, too. And a big unused space in front of our bathrooms, which would be perfect for swings. And we just bulked up our general liability insurance – perfect! But how much of a time sink would this project be? Would it work? And would the end product be awesome, or just okay? It didn’t matter, I was going to try anyway. The Internet, it turns out, is full of swing purchase options, everything from crappy plastic or wood sub-$100 swings on Amazon or direct from a bunch of shady sites, to higher-end reclaimed wood models with thick long ropes that are meant to hang for generations from large trees next to large lakes. It was clear the nicer ones were the way to go, because in addition to being sturdy, I wanted them to look great. We considered these two oak and cedar models from Dzierlenga F+U, but ended up going with this reclaimed yellow pine swing from Peg and Awl, because it looked beefier and less modern (our office beams are pretty rustic) and came with long lengths of rope, which the others didn’t. Plus, when I emailed them a question they responded right away. We chose Peg and Awl’s “small” 24 inch swings, which are actually normal-sized. The swings took about a week to arrive, reeking of character and tung oil. Meantime I’d been looking at those huge redwood beams in our office, trying to imagine how we’d hang the swings from them. I wanted the swings anchored as high as possible for the coolest look and widest swing arc. But the beams are actually two feet lower (11 feet to floor) than the ceiling boards (13 feet, basically the 2nd story floorboards) and the joists that support them. My uncle, a longtime boatbuilder and wood/rope expert, initially thought my best bet was the beams. He suggested using thick eyebolts (actually screws), sunk into the beams from the side, to loop the ropes through for a sturdy, quiet swinging experience. The bolts would have to be a couple inches above the bottom of the beam, but not any higher or the rope would hit the beam on the upswing. We also discussed how to handle the excess rope up top, potentially with blocks (pulleys) so we could raise or lower the swings at will. After sleeping on it however, I realized there was a second, easier option: removing the wooden squares in between the joists above the big beam, and simply looping the ropes over the top of the big beam, no drilling or eye screws required. By 5pm on Friday I realized that I had the knowledge and equipment I needed to put the swings up, and a free weekend, but that trying it myself I’d likely end up in the hospital. So we put up a Taskrabbit task for someone to take those wooden squares out (they were in pretty solid, with old rusted nails) and then help hang the swings. The taskrabbit – Jeremy – turned out to be an awesome guy. Not only smart, but with the integrity to say within 30 seconds of arriving that taking out the wooden squares would be stupid, because they’re structural and help hold up the building. That left us back at square one, but with Jeremy’s help we got a new plan, which was to attach a “four-by-four” piece of redwood (actually 3.5 inches by 3.5 inches by eight feet, but whatever) with 7 inch lag screws to the bottom of the ceiling joists parallel to the big beam. We could then simply hang the ropes from this 4×4 and tie them off with the half hitch knots my uncle had showed me. Unfortunately Jeremy had to leave to try to get a pit bull adopted (unsuccessfully), and ran into too much traffic to come back later. So Sunday morning was it. Jeremy bought the redwood 4×4 at Home Depot ($35) on his way over and the lag screws. I brought the work gloves to prevent us from shredding our hands on the rough manila rope (a tip from Ben on our team, who’d worked as a lobster fisherman and scallop dragger in Maine). Before putting up the 4×4, Jeremy took it outside and with a router (my uncle’s suggestion) softened the 90 degree edges so they wouldn’t chafe the rope as much upon contact over time. This also helps the ropes grip and hold the 4×4 once installed. We then got two big ladders set up, and each holding an end of the redwood bar, Jeremy and I climbed up with it. This was my big physical challenge – the thing was heavy as hell, and holding my end flush to the ceiling joists two feet above my head while standing on the top rung wasn’t easy. It took Jeremy a couple minutes to fasten his end with the lag screws before coming over to secure mine. But the minute the bar was up, I knew the swings would work! All that remained was to put up the ropes, adjust the height, and tie them off with the half hitch knots. As it turns out, thick manila rope is almost impossible to tighten into a knot that will look remotely credible. So instead we used simple cleats on the sides of the joists to tie off the rope ends. By the time we were done, my adrenaline was pumping and I was flying high – mentally and physically. The team saw the swings the next day, Monday morning. They started out cautiously, suspicious their CEO might not be a great swing installer. And the swings creaked a bit, which made people wonder (Jeremy says each lag screw is rated at 800 lbs, and there are eight of them). But by lunchtime, people were really going for it – starting with Andrew – swinging high and trying fancy dismounts. By the next day, when people were still swinging unsolicited, and having swinging meetings, I knew it was a win. By the end of the week, people were debating the physics of swinging and how tough it would be to touch your feet to the ceiling or develop sensors to detect who swings the highest. Moral of the story: take a little time off from the business crunch to do a quick physical construction project, like putting up some office swings – you’ll feel good, and everyone else will, too! Andrew and Dave, make sure Joanna gives you an “underdog”. She is a master at them!!! You paid $400 for 4 ft. of 2”x12” pine?!!? Great idea and execution! Fun to build and fun to use. Perfect. So cool! Looks like you guys are having fun!!! This is really cool. I wished we could do something like that anywhere I go… either at home, school, or even work. I know people would love to do that.